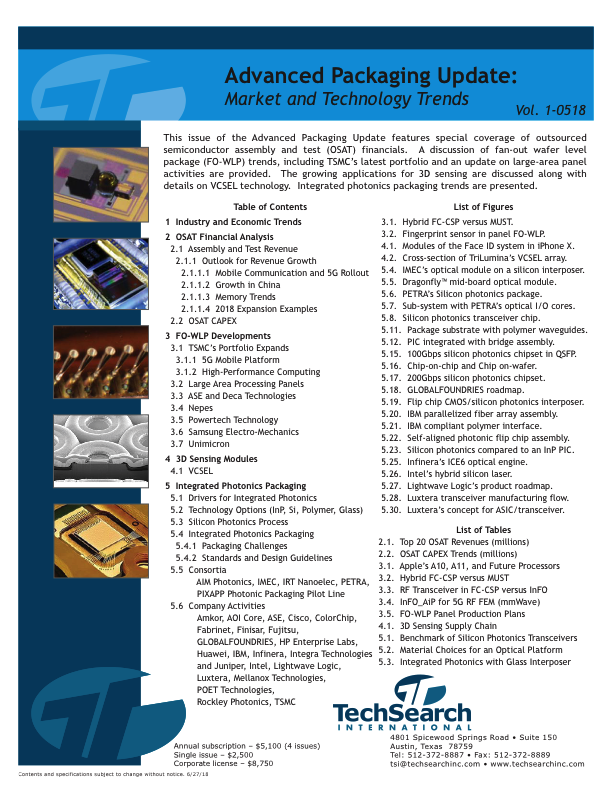 This issue of the Advanced Packaging Update features special coverage of outsourced semiconductor assembly and test (OSAT) financials. A detailed financial analysis of the industry is presented. A discussion of fan-out wafer level package (FO-WLP) trends, including TSMC’s latest portfolio and an update on large-area panel activities are provided. The growing applications for 3D sensing are discussed along with details on VCSEL technology. Developments in integrated photonics packaging trends are discussed. 1.1 Monthly U.S. housing starts. 3.1 Hybrid FC-CSP versus MUST. 3.2 Fingerprint sensor in panel FO-WLP. 4.1 Modules of the Face ID system in iPhone X. 4.2 Cross-section of TriLumina's VCSEL array structure. 5.1 Waveguide propagation loss as a function of wafer process. 5.2 QSFP module and cut-away showing module board. 5.3 Bandwidths at various interfaces of a package on a PCB. 5.4 IMEC's optical module on a silicon photonics interposer. 5.5 Dragonfly™ mid-board optical module. 5.6 Silicon photonics package evolution at PETRA. 5.7 Prototype sub-system with PETRA's optical I/O cores. 5.8 Silicon photonics transceiver chip and I/O core cross-sections. 5.9 Side and top view of 8° oblique cone-shaped optical pin array. 5.10 Optical I/O core receiver with electrical and optical I/O. 5.11 Hybrid optical/electrical package substrate with polymer waveguides. 5.12 PIC integrated with bridge assembly. 5.13 Edge coupling optical fiber interconnects. 5.14 Grating coupling optical fiber interconnects. 5.15 100Gbps silicon photonics chipset in QSFP module. 5.16 Chip-on-chip and Chip on-wafer. 5.17 200Gbps silicon photonics chipset in embedded module. 5.18 GLOBALFOUNDRIES silicon photonics foundry roadmap. 5.19 Flip chip CMOS/silicon photonics interposer. 5.20 IBM parallelized fiber array assembly. 5.21 IBM compliant polymer interface. 5.22 Self-aligned photonic flip chip assembly. 5.23 Silicon photonics compared to an InP PIC. 5.24 Infinera's ICE5 optical engine with two InP PIC modules. 5.25 Infinera's ICE6 optical engine with co-packaged DSP and PIC. 5.26 Intel's hybrid silicon laser. 5.27 Lightwave Logic's photonics product roadmap. 5.28 Luxtera transceiver manufacturing and test flow. 5.30 Luxtera's concept for ASIC/transceiver integration.